I am so excited. I got a letter in the post today to tell me that my first picture has been accepted by the Chelsea Garden Florilegium, without needing to be adjusted in any way. On top of that, the comments from the Kew Botanists who evaluated the work, were pretty good too – that made the acceptance even more special. I applied to and was accepted as a member of the Chelsea Physic Garden Florilegium in the middle of last year; full membership is limited making membership even more exciting. The intention of membership is to document all the plants that are in the Chelsea Physic Garden. As you can imagine, there are thousands, so it will take a long time. For the privilege of being a full member, everyone is meant to submit a picture each year, of one of the plants in the garden. Of course, a plant needs to be chosen that is not already in the archives. As I became a member half-way through the year I was in reality excused from painting a picture until 2016, but those who know me know I like a challenge. I painted the Fuchsia microphylla. As the name suggests the leaves are minuscule, as are the flowers, although I was surprised by the size of the fruit. Except for the pen & ink habit drawing, which is life-size, the rest of the painting is on a larger scale. Once the scale of anything is increased, the colours become much more intense. Anyone who has looked through a microscope to see the detail of grey-looking grass, will know how intense the multitude of colours is in reality. 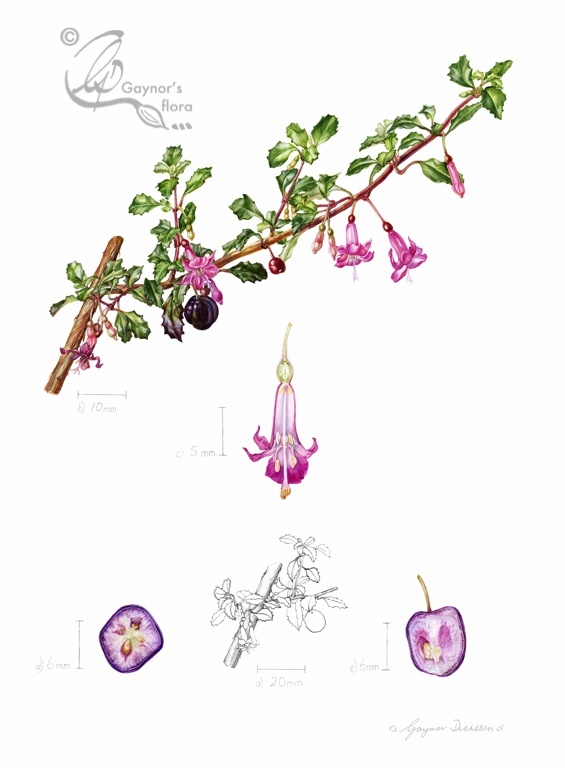 The Fuchsia microphylla was painted enlarged because it was so tiny and I wanted to convey its real beauty. I have posted the picture before, but here it is again, now as part of the archives of the Chelsea Physic Garden. Fuchsia microphylla from Chelsea Physic Garden, in watercolour with ink. < Adjusted yesterday’s blog and next botanical art workshop. Woohoo! Congratulations, Gaynor!!! I’m so excited for you! What an honor. Your painting is beautiful. Just think of all those future generations of botanical artists, gardeners, and botanists who will gaze upon it and become inspired. what an amazing legacy. Thank you Melissa. You know I hadn’t even thought as far ahead as that. I was just so pleased at having the first one accepted and especially with the good comments they gave me. What a great achievement, Gaynor, congratulations! Your painting is stunning. Thank you so much Anne. very very many congratulations. Hope we get some reflected glory too from living ( sometimes) next door.! really exciting for you . one question. is the fuschia a medicinal plant or does that not matter for the pics. ? should i start eating the berries . see you in couple of weeks if you about love to both Meredith. ps hope no revenge activity from next door but one. Hei Meredith. The Fuchsia fruit is edible, but as they are so tiny you need to eat a lot of them. I don’t know about medicinal value. See you soon. Thank you very much Elisabeth. Thanks Joan. I was very excited. Thank you very much Anita. It is an honour for me.